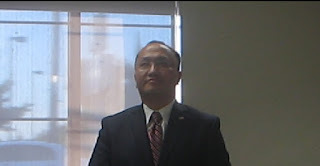 During the Tuesday, August 9, 2016, meeting of the Elk Grove-South County (Calif.) Democratic Club meeting, Elk Grove Vice Mayor Steve Ly, ducked several questions and gave contradictory answers to his fellow Democratic Party members. The Vice Mayor, who is seeking his third different office in less than four years, is now trying to replace his mentor, outgoing Elk Grove Mayor Gary Davis. As is typical for Ly, he was unable to answer coherently. Between the two questions, Ly also offered conflicting answers and at one point suggested the City Council was an exclusive club with membership requirements that only a current or previously elected officials can gain admittance too. Conversely, in response to a question regarding bringing new ideas to the council, from perhaps a female candidate, Ly said he would welcome "new blood" on the dais. Ly is facing five competitors for the two-year seat, and because of his significant financial advantage and incumbency status, he is the presumed front-runner. Watch the video to see the complete exchange.